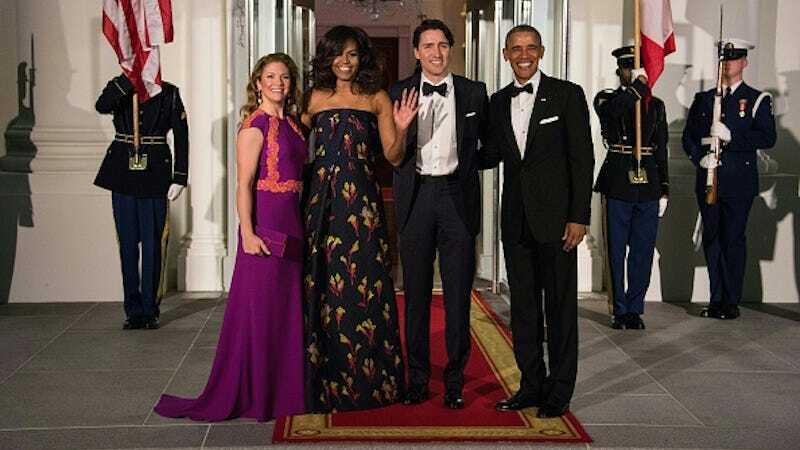 On March 10, Canadian Prime Minister Justin Trudeau and his wife Sophie Gregoire Trudeau joined President Barack Obama and First Lady Michelle Obama for a State Dinner at the White House. Together, they comprise a quartet of bonafide hotties. At the dinner, held in honor of the Trudeau’s visit, New York reports that Sophie Trudeau wore a gown by Canadian designer Lucian Matis. At first glance I was skeptical of the fuschia with coral accents, but have come around to the firm opinion that it is lovely. The First Lady, as per usual, slays in “a strapless Jason Wu dress,” and her coiffure is a triumph all its own. There’s not much to say about the male attire, but both President and Prime Minister look very studly in their tuxedos. Had I the option, I would leave room on my dance card for both of them.